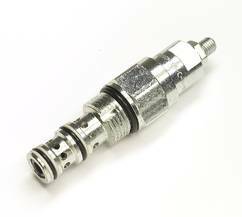 A pressure reducing valve ensures that a reduced pressure is maintained in defined areas of a hydraulic system. It is triggered if the pressure increases in the area of the valve. It blocks the flow to the controlled area until the pressure lies below the set value again. The valve basically consists of a valve housing, a pressure spring and a piston slide valve.